Nations Press feature news Possessed Woman burned with matches! Possessed Woman burned with matches! 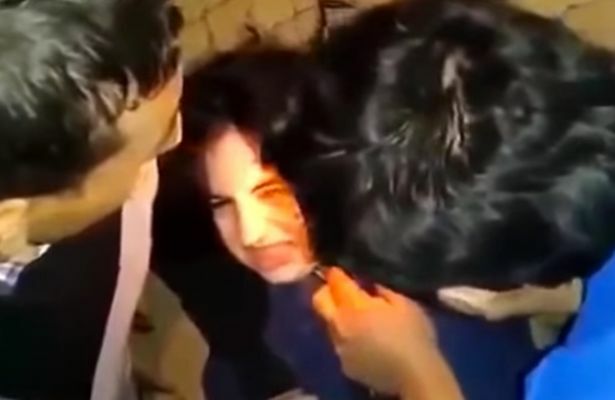 This chilling footage shows an apparent exorcism being performed on a woman claimed to be possessed by evil spirits known as "Jinn". Posted to YouTube by a group whose name translates as "It's the time for the truth", the video begins by explaining that in Islam Jinn "are spiritual beings that can attack humans by order of Shaitan or Iblis, the equivalent of satan in Christianity". It goes onto say that "a demonic possession and an exorcism or deliverance exercise of a woman victim of one of these evil spiritual beings is shown". Footage begins with the woman squirming as two men grip her, one by the wrist and one with his hand over her forehead.One of the men starts reading from a religious text as the woman's eyes intensify and she continues to writhe, hiss and bear her teeth. The man lightly hits her on her arms and forehead as he carries on reading.About 30 seconds later she jumps from the sofa, hissing and chest lurching, before she drops back down and lays motionless with her eyes open. She remains in the position until the end of the video. The video emerges a day after another video was posted online showing the terrifying moment a delirious woman believed to be possessed by a demon spirit shakes violently as friends desperately try to calm her down.The woman, named as Carmela, can be seen lurching backwards and forwards on a stretcher as her eyes roll into the back of her head. But she replies in a hoarse demonic voice saying: "She is going to hell."